This tool is essentially an interactive version of the charts I originally published two years ago in my first post analyzing SportVU motion tracking data. 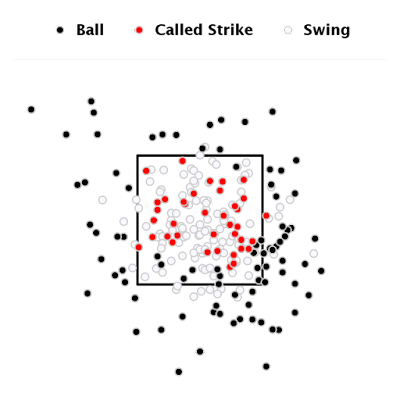 For those of you familiar with MLB's PitchF/x system, which can track each ball's placement relative to the strike zone, this is a similar view, but for free throw shooting. 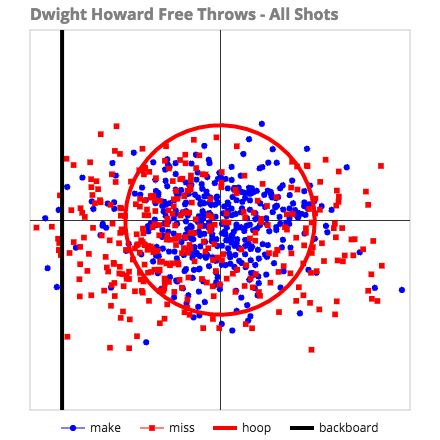 By analyzing the raw SportVU data on ball motion and applying a simple physics model, I can chart where a player's free throw shots land relative to the center of the hoop. 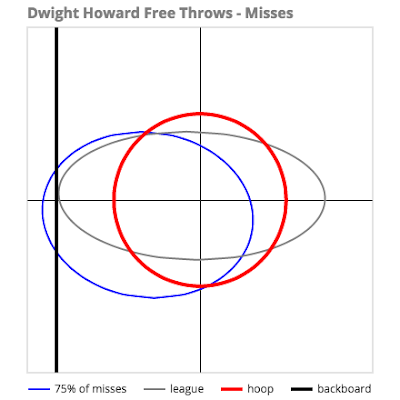 The blue dots show made free throws and the red dots are misses. My code does its best to make sense of the SportVU data, but some anomalies remain (e.g. 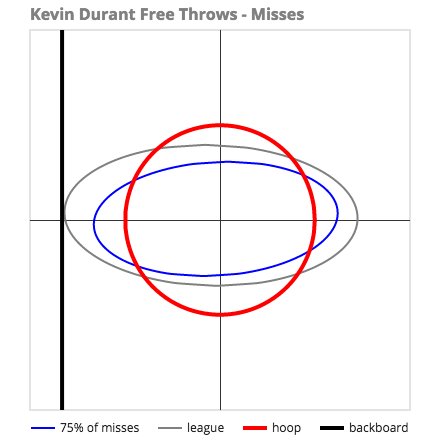 the blue dots that fall well outside the hoop). The blue ellipse represents where 75% of Kevin Durant's free throws land. The gray ellipse is the league average. 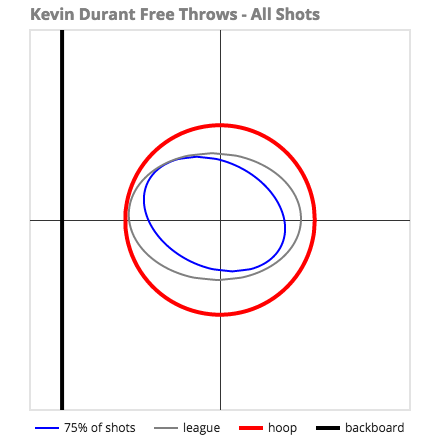 Durant is an above average free throw shooter, so it makes sense that his shots fall within a tighter boundary ellipse than the overall league. I call these "shot orbitals" as they are similar in concept to quantum orbitals, which are visual representations of where electrons in atoms tend to spend most of their time. 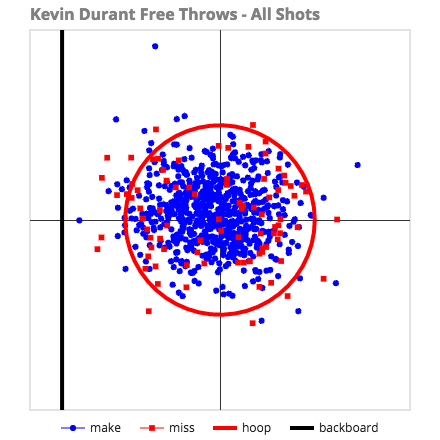 Similar to his total shot view, even Durant's misses are less scattered than the league. Also note the oblong shape of both orbitals. This tells us that misses free throws tend to be of the "too strong / too weak" variety, rather than "wide left / wide right". When Dwight misses, he tends to miss too strong, rather than fall short. The tool has shot charts separately for the 2013-14, 2014-15, and 2015-16 (partial) seasons, as well as a total view. With the NBA taking down public access to detailed SportVU data in January 2016, I unfortunately do not have any views of the current season. There is currently a wealth of data and analysis coming out of Major League Baseball these days on ball motion, both during the pitch and after the ball leaves the bat. While the NBA has helped foster the creation of a whole host of new SportVU-based statistics (Catch and Shoot, Pick and Roll, etc. ), their lack of focus on the motion of the ball itself feels like a missed opportunity.